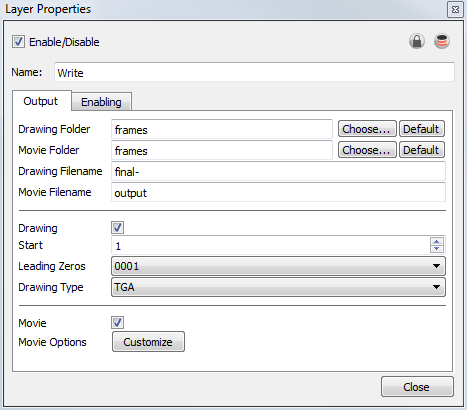 To render your scene you must first choose the type of rendering and then set the rendering parameters. • Local Rendering is is done directly on the user machine using its CPU. To perform local rendering you must use Harmony Stage. • Batch Rendering lets you send a scene to render while you continue working in Harmony Stage. This way, you do not have to wait for the application to complete the render process. Batch rendering is a background process divided over several machines, or a render farm. Sending your scene to batch render will share the rendering load with other machines in the render farm and lessen the amount of work required by your computer. The parameters for the format and file type to render are set in the Write modules contained in your scene's Network view. Before sending your scene to batch rendering, make sure to set the Write modules to export in the proper location, and set the format parameters. Note that you can have more than one Write modules in your scene if you require several exports.